German theologian Hermann Sasse (1895–1976) was trained at the University of Berlin but became a convinced confessional Lutheran after discovering the writings of Wilhelm Löhe while studying in the United States. His professional career at the University of Erlangen was forever marked by Hitler and the Nazis. Sasse was a vocal opponent of the Third Reich and participated in efforts to prevent “German Christian” control of the state churches. Following the war, Sasse emigrated to Australia, where he served as a professor at Immanuel Seminary (now Luther Seminary) in North Adelaide. 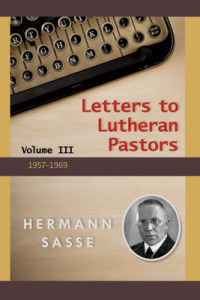 In the late 1940s, Sasse began more than thirty years of correspondence with Lutheran pastors around the world in his Letters to Lutheran Pastors, which addressed issues as varied as the Ecumenical Movement, the Sacraments, Lutheran-Catholic dialogue, and Scripture. In this excerpt from Letter 60, “Thoughts at the Eve of the Reformation Anniversary of 1967” (written in 1966), included in the third volume of Letters to Lutheran Pastors (forthcoming early 2015), Sasse reflects on the state of the Lutheran Church and the ability of the church and believers to confess as the 450th anniversary of the Reformation approaches. Things have certainly changed in the world since the first anniversary of the Reformation. Yet the final do-or-die questions of theology have remained the same. God has remained constant regarding His wrath and His grace, regarding His Word in Law and Gospel. Christ the Lord has remained the same and is present with us in the Gospel and in the Sacrament as He has been at all times. The Holy Spirit is present and efficacious in the means of grace, as He has always been. And even man has remained the same in his misery, though he would not desire to recognize it. For the man of our times, ostensibly come of age, is really not so elevated above sixteenth-century man. Claus Harms compared people of the sixteenth and nineteenth centuries in one of his theses for the Reformation anniversary of 1817: “The forgiveness of sins cost money, believe it or not, in the sixteenth century. In the nineteenth, however, one gets it entirely for free, for it is self-serve. That time stood higher than ours, because it was nearer to God.” And what about the progress of modern man on the way to ever-greater maturity? Who does not think at this point about Kant’s definition of the Enlightenment? With such “maturity” comes distance from God, who is not the God of the wise and clever but of the child (Matt. 11:25). When this maturity is supposed to have grown so great that, as the message of the Lutheran World Federation from Helsinki suggests, modern man no longer understands the question about a gracious God, but rather sets up the “far more radical” question of whether God really exists, then what Luther says in the explanation of the First Commandment in the Large Catechism remains true: the question about God is the question about the God who one can “trust and believe from the heart” and who is ever our sanctuary (BSLK, 560, lines 22f. ; 564, lines 9f.). Any other question about God is philosophy. In all of the religions upon the earth, and still today in idolatry, there is embedded, according to Luther, the great human question of life, the question concerning the gracious God. Were it the case that this question is no longer understood today, then that would not be a sign of maturity, but rather of the spiritual blindness that fosters and precedes spiritual death. Yet every pastor knows that in the reality of life, the question about the gracious God, the question about human sin and divine forgiveness, breaks forth again and again and becomes the deepest question of human life. . . .
Amid the dissolution and decadence of our church, the Lutheran Confession remains a lively truth that cannot be hidden by mass demonstrations, anniversary celebrations, theology of glory in books and church newspapers, sermons, and festival speeches. How is that, really? A confession is nothing when it only stands written in books and remains on paper de jure in authority. A confession must be confessed. There is no confession without confessors. Even if the number of these confessors is small, so small that it sometimes appears that they no longer exist, from this minority “in this gathering which is called church” (cf. the Ap of CA VII–VIII 10f., BSLK, 236.7f. ), there proceeds effects that no one can explain. The real history of the church is always a history of the minorities. That should be remembered in an age of mass movements. That goes for the history of the ancient church from the days of the apostles onward as much as it does for the history of the Reformation and for that which plays out in global church history. The minority of those in the Lutheran churches of the world that have preserved the faith of the catechism and the Augustana in the heart and that pray for the church is the hope of our church. The power, however, that the Confession holds lies alone in its contents, that is nothing other than the Word of God that it confesses and of which it testifies before the world. By the fact that the Confession testifies to the Word of God, it participates in the liveliness and sturdiness of this Word (Heb. 4:12). These are thoughts with which we should encounter and experience the remembrance of the Reformation in the year 1967. It should be for all of us a year for delving into Luther’s theology. Let us lead our congregations deeper into Lutheran doctrine, for which the Large Catechism is a wonderful aid. Let us also richly use Luther’s Ninety-Five Theses. They take sin and forgiveness seriously. Their powerful call to repentance forms the basis of Christian life. And this edifies faith in the Gospel, which is basically nothing other than absolution. And the theses’ theology of the cross is profound. This excerpt has been amended from Charles Schaum, trans., “Thoughts at the Eve of the Reformation Anniversary of 1967,” pages 412–13, 428–29 in Letters to Lutheran Pastors, Volume 3, ed. Matthew Harrison. © 2015 Concordia Publishing House. All rights reserved. 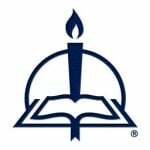 To order Letters to Lutheran Pastors, Volume 3, please contact CPH at 800-325-3040 or visit www.cph.org. Concordia Publishing House has also published Letters to Lutheran Pastors, Volume 1 and Letters to Lutheran Pastors, Volume 2.